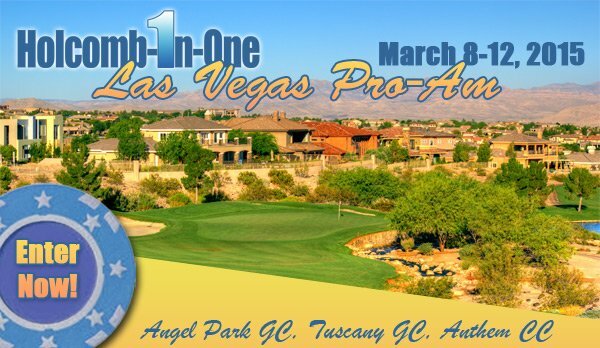 Join us on our yearly trip to play the best golf courses in Las Vegas! This year’s event will take place March 8-12, 2015. We have the opportunity to enjoy three fantastic golf courses once again – new this year is Angel Park GC, along with old favorites Tuscany GC and Anthem CC. Why not plan an emergency nine after the 12:30 shotgun at Angel Park on the lighted par 3 course? Get your team together today and make sure you are one of the first 24 teams entered. Tournament headquarters for this exciting event will be Monte Carlo Resort & Casino. The Monte Carlo recently went through some upgrades with an entire new entrance to The Strip. Suddenly you have more dining options at the Monte Carlo, including Double Barrel Roadhouse, 800 Degrees pizza, Yusho, Blvd Creamery and Sambalatte – all facing Las Vegas Blvd. Click here for entry form! • Limited to the first 24 teams. Grant Holcomb is returning as our title sponsor with his companies Antigua, Slazenger, Sun Mountain, Voo Doo Performance Towels, Range Servant and Imperial Headwear. We hope to see you in Vegas! * The cost increases $150/player after November 30, so enter now!